Hello friends, how are you all doing! Today is the day we are debuting a brand new collection at Heartfelt Creations.Long days filled with sun rays begin to fade and the crisp evening breezes begin to call for some cozy wool knit sweaters as the fall season slowly ushers out the lazy days of summer. I have a water color background canvas welcoming the autumn days and also the bright sunny sunflower. Its a mixed media canvas measuring 8" x 6". Layer a thin coat of white gesso on the canvas. Using texture paste and stencil create the first layer and heat dry it. Sprinkle water and then random sprays of water color, sprays and shimmer color. In between every layer, heat dry the canvas. 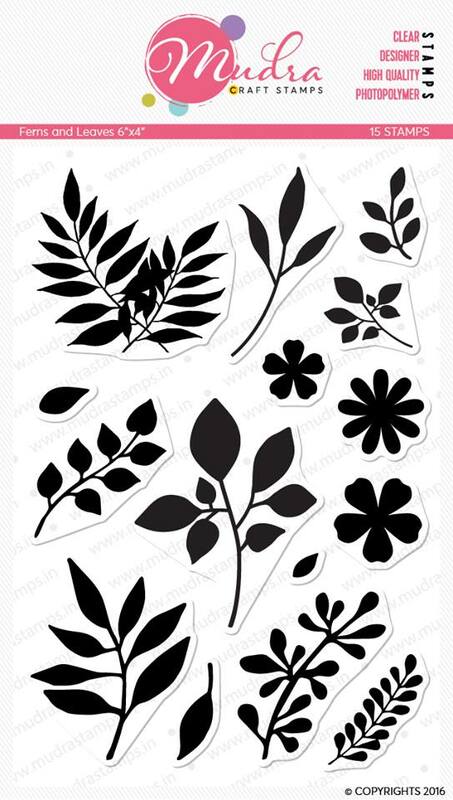 Stamp and die cut several pieces from the HCD1-7153 Sunflower Accents Die and stamp set in Archival Black ink onto white cardstock and diecut with coordinating die. Color each of the accents using any medium (here I have used water color using distress inks). 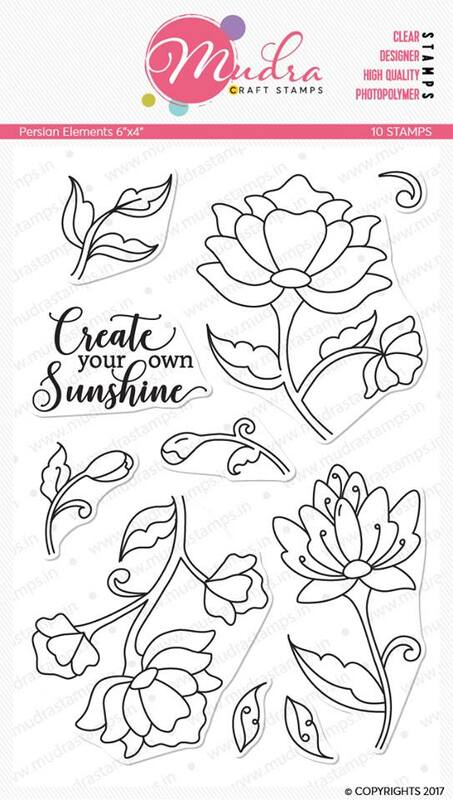 Also stamp and die cut several pieces using the HCD1-7153 Sunflower Accents Die from Beary Fun Retreat Paper Collection using Archival Black ink on white cardstock. This will form the foliage and filler leaves. Color with distress inks Vintage Photo, Pine Needles, Twisted Citron, Barn Door. Shape using the Deluxe Flower Shaping kit. 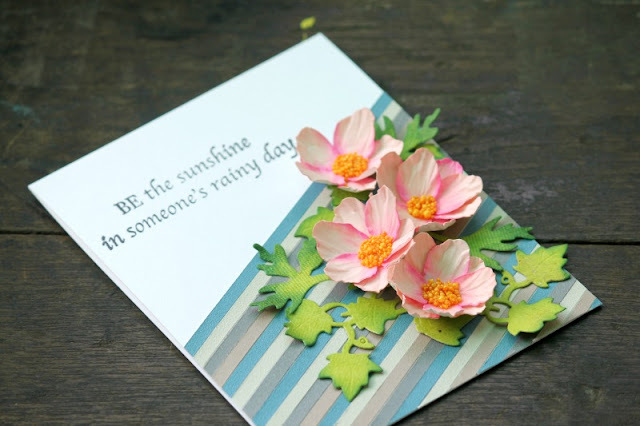 For the center die cut several pieces of the Sun Kissed Fleur using white cardstock and then color and shape the petals and leaves using the Deluxe Flower Shaping kit. Complete the flower with some center prills. 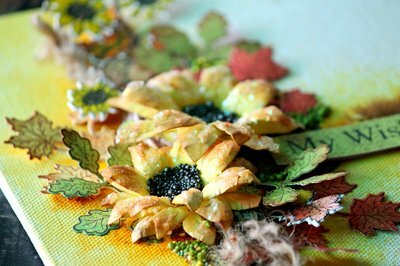 To assemble all on the canvas, use soft gel to place all the leaves, sunflower accents and then some twines. To finish the canvas layer the large sunflowers. Embellish with some art stones and prills. Use a sentiment from the paper collection and tuck it on the canvas. Do share your views , comments and love. Would love to see your creation. Untill then Happy Crafting and will be back soon. Hello friends, welcoming you to my post. I appreciate you stopping by. 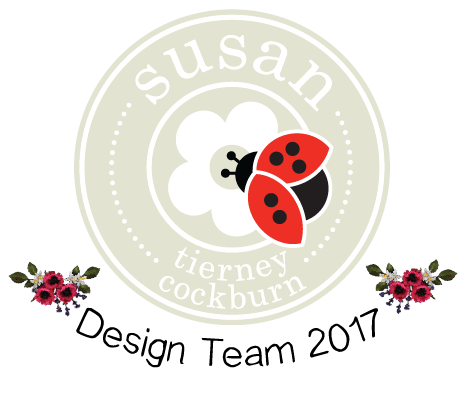 Today I have a brand new card using Susan's Anemone flowers. I have made many projects with this flower and somehow I dont get enough. Its a beautiful flower and love love working on it. Now for any of my card/projects I love to create a background/backdrop on which I lay or assemble my bouquet of flowers. Every time I try and create something new whether its tone-on-tone , watercolor , mixed media , texture background or something new. This time I used some scraps of solid card stock to create the backdrop. I had seen a video long back from Jennifer and always wanted to try this technique. 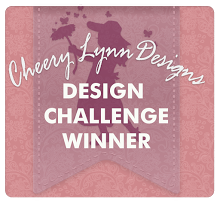 This month I am hooked to this background and I am in the spree to make more and more of this background. 1. 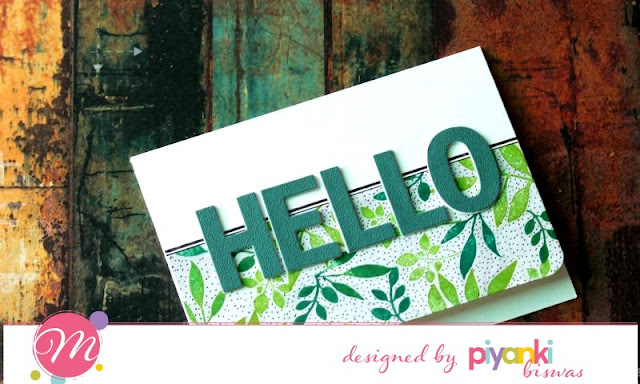 Cut and score a white card base to 5.5" x 4.25"
2.Cut several thin strips from coordinating color card stock. 3. 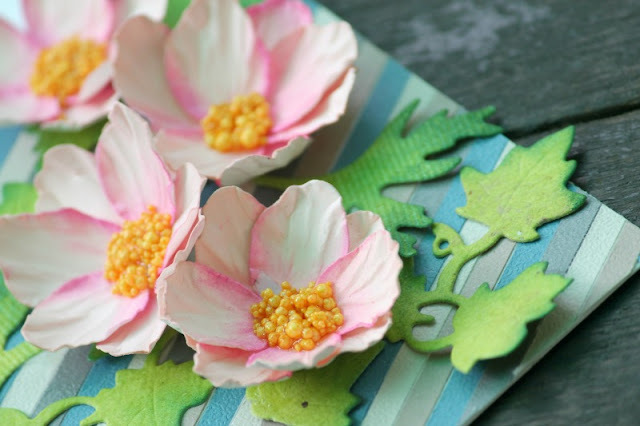 Die cut, color and shape several Anemone along with the leaves. 4. Fill the centers and keep it ready to assemble. 5. Adhere all the strips onto the card base. 6.Snip off the extra ends from both sides of the card. 7. Assemble the flowers and leaves. 8. 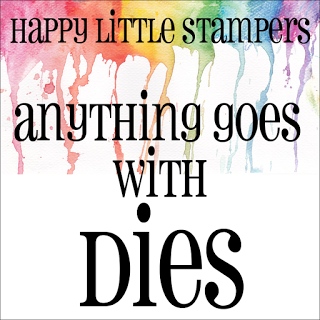 Finish the card with a quote from the stamp set. Do share how you like my project. 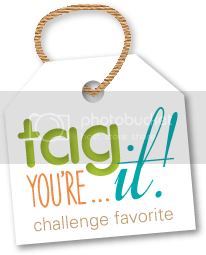 See you soon at the next blog! Hello Friends, Piyanki here. Welcome to another brand new post. 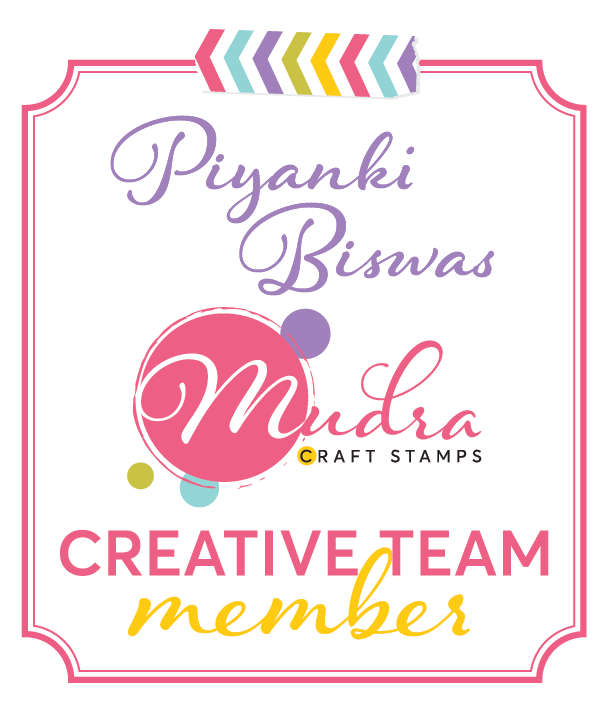 At Mudra we have a very fun interesting challenges launched this month. Yes Reverse Stamping or you call it Mirror stamping.Its a very interesting and versatile technique. It allows you to use your stamps in a very efficient way. Today I have 3 cards for your. I have not used reverse stamping though however you can refer to my previous post here. 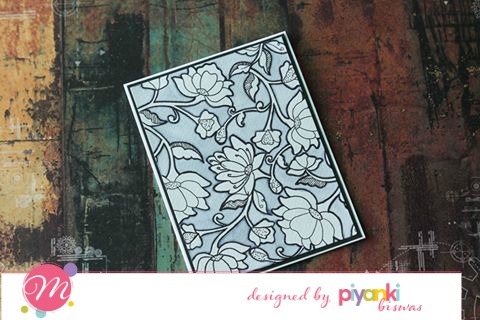 A very simple card adorned with the Persian elements set. 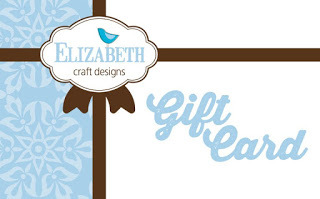 To make the card do random stamping with black archival ink on a neenah white Card stock. Using Zig color all the background or the negative space. Later with a sharpie bold the outline throughout the card. Did not add any sentiments or embellishments considering the background to be bold. Place the colored panel on a double layer card stock for the base. 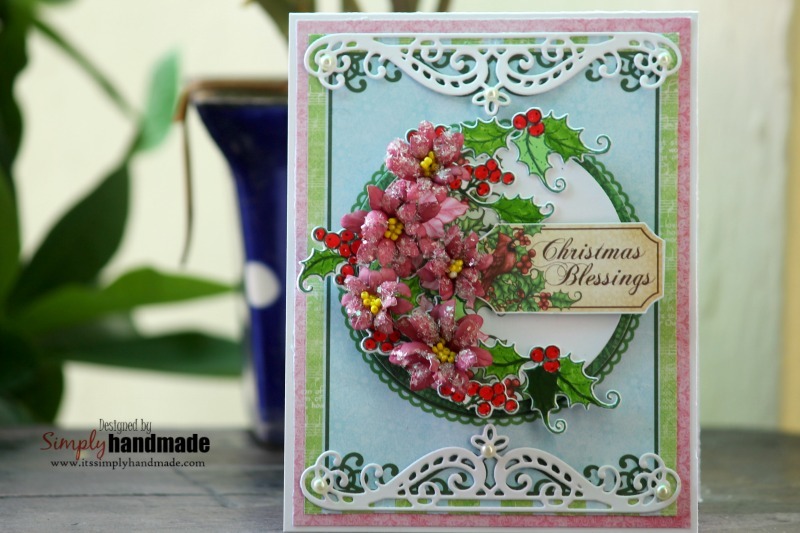 For the second card I used different shades of Hero Art Green Ink and then repeat stamping using the Fern and Petal set. Later using a Sharpie I bordered the panel and also did multiple dots on the negative space. Cut a 1/2" strip of the front panel. 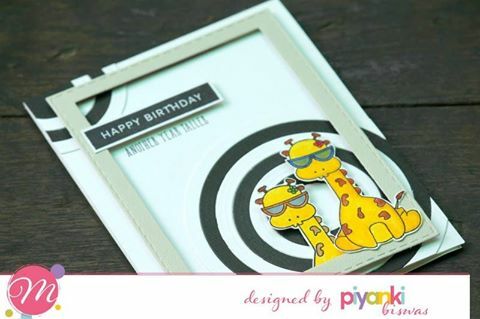 To add the sentiment die cut some bold alphas using the same coordination color. 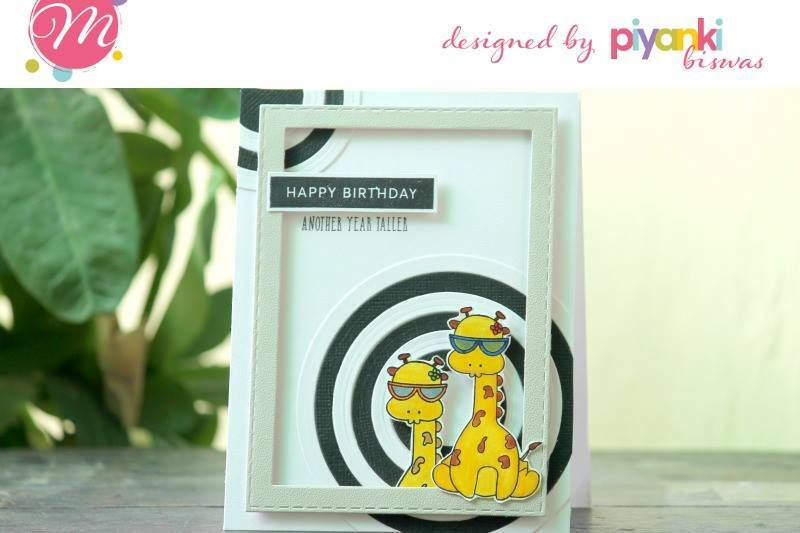 For this one, it was a super fun working with the Giraffe mini set. 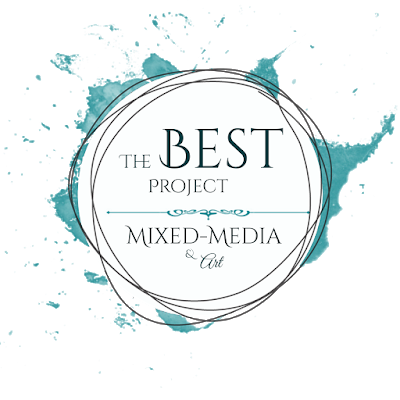 Its a small one however can do wonders on your project. 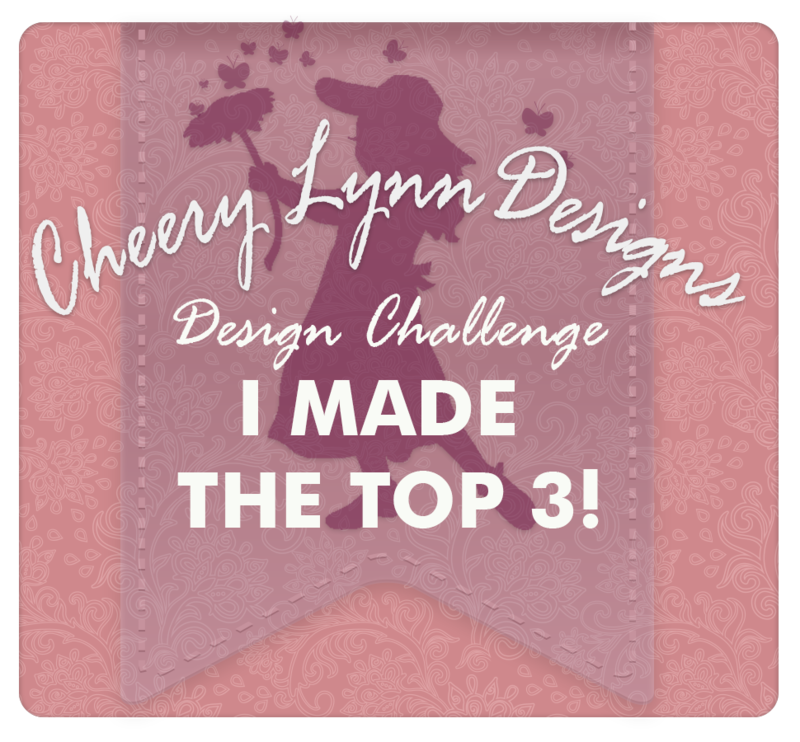 The way I created this card using some technique I was inspired by Jennifer. I die cut several pieces of concentric circles from black and white and adhered to the 2 corners of the card. Later die cut a rectangle frame and adhered on the top. Colored the giraffe using zig and fussy cut and places it on the top. Do share how you like the cards and projects. Would love to hear from you. Will be back soon with some fun projects. Hello friends, welcome to yet another post where we are still in Christmas. Lols, yes we still making Christmas Cards and loved doing that.July - August has been fun making Christmas Cards. 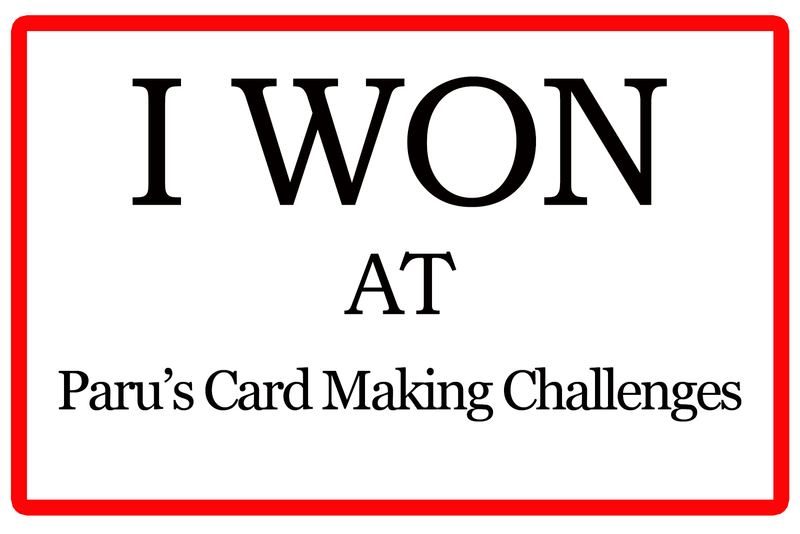 Today I have a very quick and easy cards. 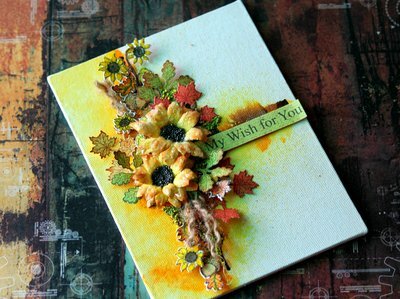 If you make flower on the go or create your flowers and keep it handy making such cards will be spot on. This card measures 5.5" x 4.25" and its a 20 minute card. 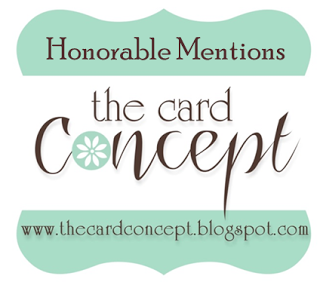 Cut and score a white card stock to 5.5 x 4.25" to form the base of the card. Take a coordinating paper from the festive eve collection and cut it at 1/8" less than the card base. Choose a card panel from the paper collection and cut it at further 1/8" less. 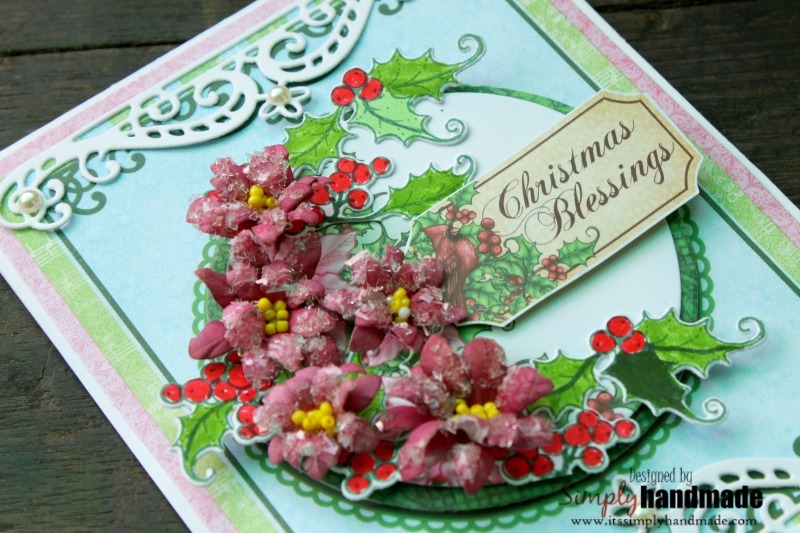 Use a small circle die and die cut the center piece. Die cut another circle using coordinating green paper and adhere it at the center using some foam tape. Adhere the panel on the card base. Die cut 2 decorative borders using white card stock and adhere on the bottom and top of the card. This finishes the basic card base. 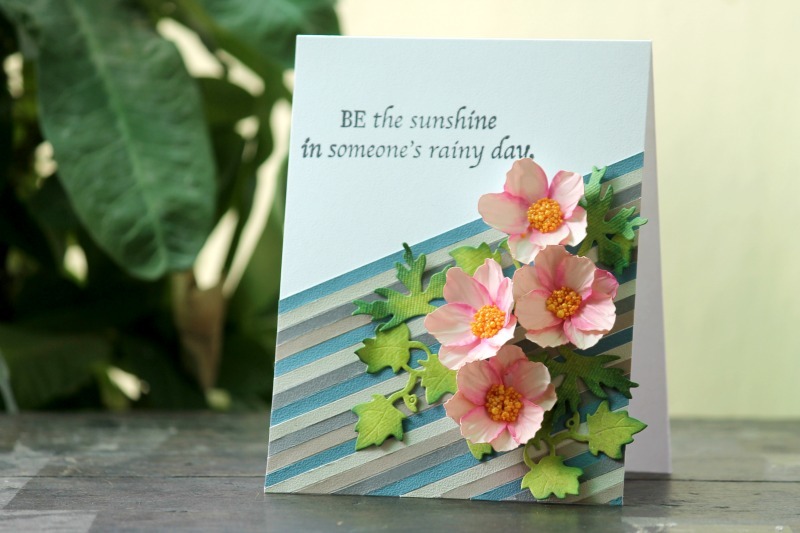 To embellish the card, die cut several pieces from the sun kissed collection using plum archival ink on white cardstock. Color using same ink and shape with the deluxe flower shaping kit. 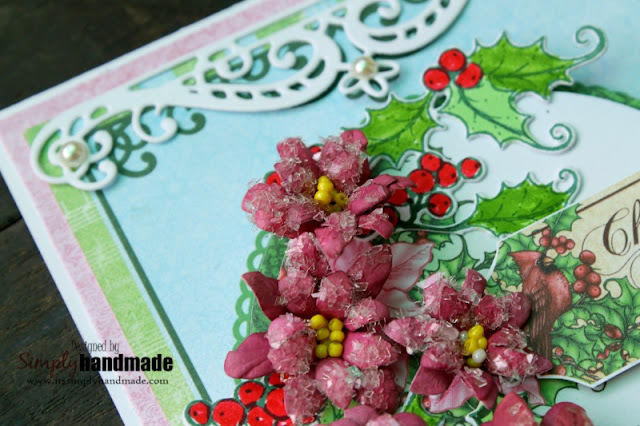 Finish the flower by adding some crystal clear powder and beads for the center fills. Stamp and die cut some festive leaves from the Festive Holly set on white cardstock using black ink. Color them using zig clean markers. Once the flowers are shaped arrange the flowers in a bouquet layering into one side of the circle center piece and tuck in a small sentiment from the paper cut out and matted on white cardstock. Finally add some pearls to the white decorative borders as shown. 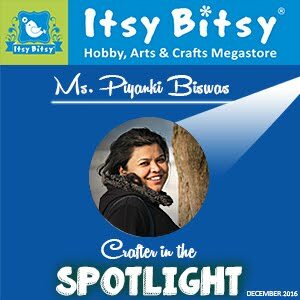 Do share how you like it, leave your comments , love and I would love to know what you create with these beautiful products.